At the highest and most scenic point in Positano, where the twisting lanes and picturesque stairways all come together in postcard-perfect harmony, Villa Magia sits perched on the craggy Amalfi Coast, ready to woo you with five whole floors of coastal beauty and charm. As its name suggests, this 18th century villa, part of which incorporates an ancient watchtower which guarded this length of coast from Saracen pirate attacks, has a touch of magic. Lose yourself in the sweeping views over the Amalfi Coast from the scenic terraces, tucked away in the most romantic spots of the garden which surrounds Villa Magia. The villa is in the midst of 3000 square meters of lush garden, where guests can pick their own fresh fruit and vegetables for meals al fresco on the terrace overlooking the Mediterranean. Each of Villa Magia's five floors is uniquely beautiful. The first floor is dedicated to the day rooms: two semi-professional kitchens (one indoor and one outdoor), joined by a large living and dining area carefully furnished and decorated with artwork. The second floor has two large and elegant suites, both of which boast the most modern of luxury amenities, including private terraces with a view. The villa's master suite has a fabulous private Jacuzzi, from which guest can enjoy the uniquely spectacular view which includes both the Spiaggia di Fornillo and Spiaggia Grande beaches. The most historic section of the villa was once a defensive watchtower guarding against Saracen invasions, and is now two additional suites, both of which are decorated in coastal Positano style and which share a third kitchen with an outdoor patio. From here, guests can enter the pool and sundeck area, cooling off with a dip and an equally refreshing view over Positano. The fourth and fifth floors of Villa Magia are dedicated to Villa Luna, which has a separate entrance, 3 guest bedrooms, and a pool. All the privacy and comfort of an exclusive residence, but with the services of Villa Magia: the fitness area, the spa, and the restaurant! 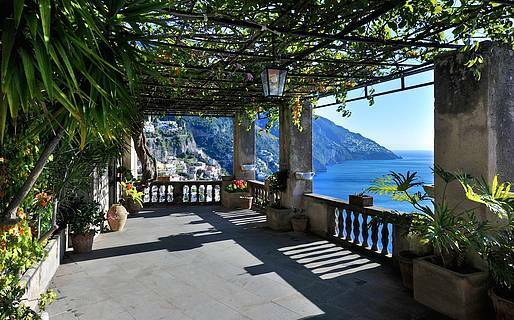 Reserve your suite at Villa Magia and enjoy magical Positano from a luxury boutique hotel! The entire villa can be reserved for your exclusive use in some times during the year, so contact us for information and availability! Celebrate a magical wedding day at Villa Magia with the help of the professional wedding planning agency Regency, which will take care of all the details for your ceremony and reception, including logistics, decor, and photographers. Have the wedding you've always dreamed of from the scenic terraces of Villa Magia! In the last 30 days 63 people have visited this page. Villa Magia is a luxury village located at the highest point of Positano, from which guests can enjoy one of the most breathtaking views along the Amalfi Coast.